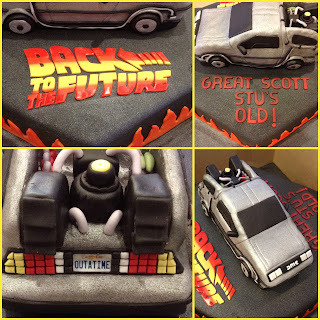 Stu's blog.. : You built a time machine...out of cake? You built a time machine...out of cake? Have you ever watched The Cake Boss? I love watching people's faces when they see their cake for the first time. That happened to me, as my wife surprised me with this amazing cake from a local Mom who does cakes here in Ottawa. Lisa Warren who made the cake from my favorite movie said she learned how to make cakes like this from watching Buddy Valastro. The Delorean was delicious. Doc Brown would be impressed!